Super Bowl Sunday in Dot! Surprising to no one, the New England Patriots are in the Super Bowl, which means, unless you have a golden ticket to Atlanta, it’s time to decide where to watch the game. Whether you’re looking for a massive screen or the best drink deals in town, we’ve rounded up which Dot spots you should head to on Sunday. Lucy’s American Tavern is Super Bowl ready! Plenty of big screen tv’s, sharable appetizer like Italian egg rolls, Lucy’s famous wings, and don’t forget their burgers! Lucy’s will also have some Super Bowl additions to their menu and they have 27 draughts on tap! Lucy’s also offers beer flights too! 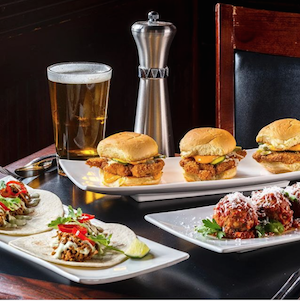 dbar on Dot Ave is offering all the game day snacks on Sunday for just $4 from 5:30-9pm. Expect plenty of sliders, tacos, arancini and more! The Bowery Bar is accepting reservations for the game! They’re also featuring a some Super Bowl specials like G.O.A.T. Grilled Cheese, Cheesesteak Potato and Popcorn Rock Shrimp! Polish American Club is hosting a Super Bowl Bash! Watch the game, drink cheap cocktails, eat some snacks and get cozy by the fireplace! Party starts at 6pm! Ashmont Grill is hosting a Super Bowl Brunch for all you wanting to pre-game! Featuring specials like biscuits & gravy, AG poutine made with hand-cut fries, mozzarella cheese curds, duck gravy, fresh herbs and buttermilk fried chicken sandwich, fill up your belly, take a quick nap and be ready for kickoff at 6:30pm! Savin Bar + Kitchen is offering game day specials – including 50 cent wings, game day nachos, and sliders! Literally sit in the middle of all the action. Harp & Bard has over 10 HD TVs so there isn’t a chance that you’ll miss a single play! Try their Ultimate Nacho Platter and their Crispy Fried Chicken Wings! Pregame at The Industry with live music with Derrick Keane from 1pm-6pm! During the Super Bowl, enjoy complimentary passed apps! Did we miss your favorite spot for Super Bowl Sunday? Let us know in the comments below!